Having the right information on hand is crucial to successful feedback conversations. 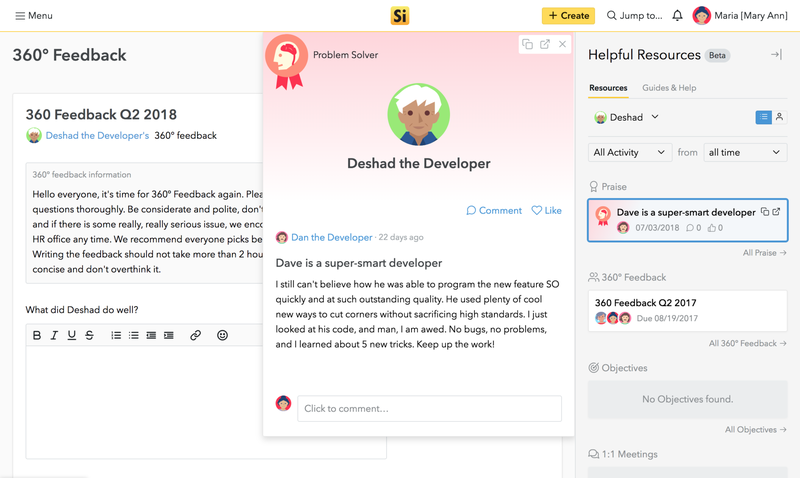 That’s why we’re excited to introduce the Helpful Resources sidebar, a big step towards helping team members write meaningful feedback and better prepare for performance conversations. Our new sidebar displays all Small Improvements activities connected to an employee or manager. This allows you to easily reference praise, objectives, feedback, and more when using 1:1 Meetings, 360 Degree Feedback, and Performance Reviews. No need to dig through notes or keep multiple tabs open. Now you can access and view all relevant information about yourself and another person directly from the sidebar on the right side of the screen, allowing for a seamless overview of current projects and activities. 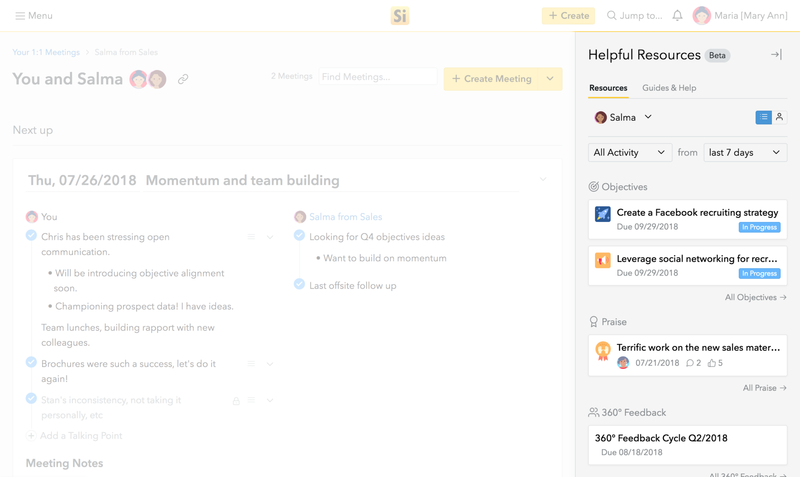 Simply filter by the activity – Objectives, Praise, 360s, Reviews, and Messages to find the information you need. For more context, you can also filter by time frame, e.g., last seven days or last year. Both parties can also make updates to other Small Improvements activities without navigating to a different screen. That way, you can easily change the status of objectives, check off key results, and add talking points on the fly during a 1:1 meeting or performance review. 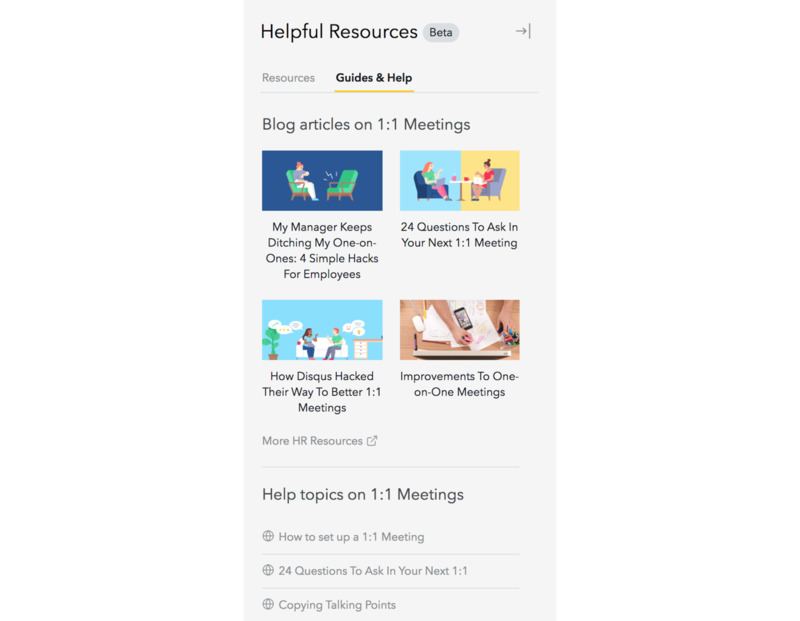 The Helpful Resources sidebar reinforces the importance of continuous feedback by bringing together all of the features in Small Improvements, making performance conversations more informed and actionable when they occur. For managers, having an inventory of relevant resources makes it easier to catch up on what their direct report’s been up to and ensures nothing falls through the cracks. For example, being able to see a direct report’s objectives at a glance will remind managers to check on progress during a 1:1 meeting. And seeing recent Praise will encourage managers to recognize good work in a performance review. With our sidebar, employees are able to reflect on their recent objectives, accomplishments, and peer feedback when preparing for a 1:1 meeting or performance review. This helps them recall performance highlights and challenges, paving the foundation for 1:1 Talking Points and self-evaluations. The Helpful Resources sidebar also captures a broader perspective of employee performance. Both managers and direct reports get a better sense of how they have grown over the last period, which allows them to better identify strengths and growth opportunities. Not everyone is an expert at giving and receiving feedback. That’s why we’ve included helpful articles in the sidebar, so managers and employees can easily find the guidance they need, when they need it. Perhaps you’re looking for new questions to spice up your next 1:1 meeting. Or maybe you’re unsure of what to write in a performance review. Instead of combing through our blog or conducting a Google search, now you can find useful tips directly under the Guides & Help tab. If you need more instructions on how to use Small Improvements, we’ve also included Help articles in the sidebar to help you get the most out of our modules.